Location: Boussac, in the Creuse departement of France (Limousin Region). Notes: Château de Boussac is located in the department of Creuse and Aquitaine-Limousin-Poitou-Charentes region. Boussac is along the Petite Creuse (tributary of the right bank of the Creuse), about 40 km north-east of Guéret.Les footsteps of George Sand and Pierre Leroux permeate this place.It is on a site occupied since Roman that Marshal Jean de Brosse, rebuilt in 1400, the castle of Boussac on the site of an original castle of the twelfth and thirteenth centuries destroyed by the English. It was remodeled in the sixteenth and seventeenth centuries. It consists of a rectangular building flanked by a large round tower, two square towers and a staircase tower with three sections. The south-west tower has retained some of the crows of his former battlements. The front of this castle side of the Petite Creuse austere appearance with brown stones, punctuated by rectangular towers topped with tiles. Skylights date from the fifteenth century, gabled hooks, finials and blazing compartments and a stair gate pointed arch has a carved tympanum. The windows of the first and second floors were altered in the eighteenth century. Inside the castle the guardroom has said two small fireplaces and large fireplaces both the fifteenth century that were classified as objects in 1998. On the second floor you can see the room as George Sand occupied several times, especially during an epidemic which forced him to move away from Nohant and during the war of 1870. The wood paneling of the room of George Sand which date from mid-eighteenth century were also classified as objects in 1998. 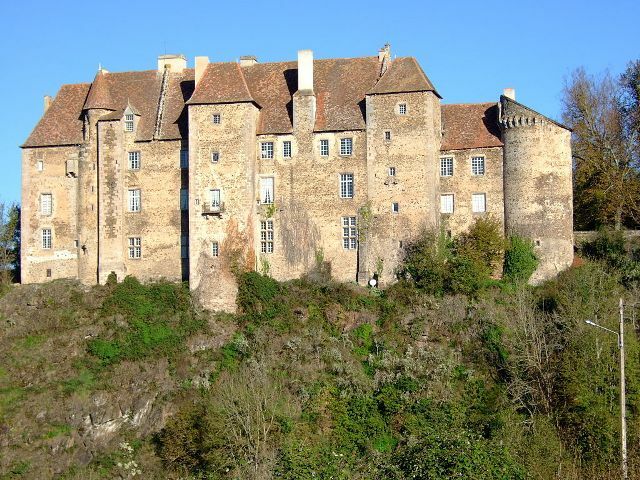 The castle was a historical monument by decree of July 25, 1930.Yielding to the entreaties of the popular board Lépaud, relayed by the administration of the department, the municipality of Boussac, reluctantly, decided the dismantling of the castle in April 1794. The contractor, for a sum of 8,400 pounds (payable in assignats ? ), it proceeded from the month of July: he filled the ditches, shave the keep and the roofs "proud" of the towers, cut down the gate and fortifications etc. The building main body yet remained almost intact. Its front door has still above the lintel, the arms of the family brush carved in stone. Sold in 1833 to the municipality of Boussac by Pauline Carbonnières, daughter of Charles Henry, became Countess of Ribereix, bought by the department, the castle housed, from 1838, the office of the sub-prefecture of Boussac. It's Prosper Mérimée and George Sand who discovered the six panels of the "Lady with the Unicorn" tapestries made famous in Flanders today centerpiece of the museum of the Middle Ages in Paris.